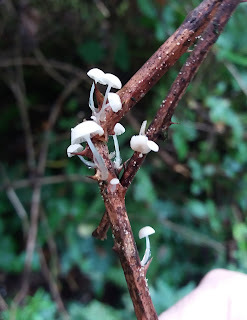 The caps of these little Mycena were no more than 1cm in diameter, and growing on dead stems in a Bramble thicket, so easily missed. The "slime" on the lower part of the stem gives them their other common name which is the Slimy Bonnet. Most of the records (any many of the Fieldguides) list them under their old name which Mycena rorida. For many years this was Mycena rorida ---- a splendid name and a species of 'toadstool' Nigel Stringer recognises! I have never seen fungal bioluminescence with any species. Marty Ainsworth took a photo of Armillaria ectypa (from Ffrwd fen) showing the gills shone in dark. This is Roridomyces roridus = Dripping Bonnet as R.austrorida is a southern hemisphere species (Austraslia etc)---- I think !